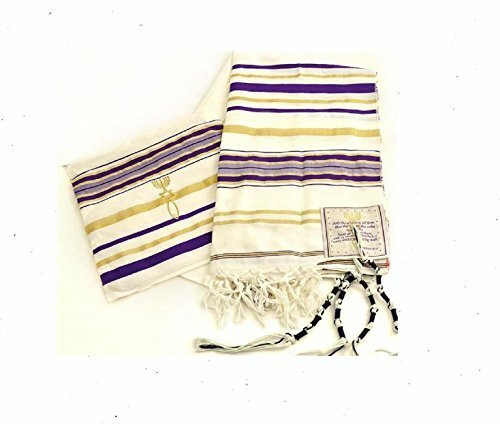 The New Covenant Prayer Shawl is designed with the main center Christian prayer in Hebrew letters & the Four prayers placed on the four corners In English. The unique early Christian sign is embroidered with golden thread. The Material Acrylic (Polyester) 70% Cotton 30% and the size is 72" long and 22" wide (180cm x 55cm). Tallit comes in a bag with zipper from the same material of High Quality. all corners contain the white and black thread A few years ago a Clay Jar was excavated in Israel which carried the early Christian seal that contained The Menorah, Star of David and the Fish is sign known as the Early Christian Sign. This Sign is placed on four corners of this shawl. This Sign contains the 7 Candle holder on Top, The Star of David in the Middle and the Fish on the bottom. The fish was used by Christians for identification during the Dark Roman Occupation in the Holy Land. The main Prayer in Hebrew on the (Atara) reads in English as follow: Blessed are you O' Lord King of the Universe Who has fulfilled all of the law through Jesus the Messiah and have covered us with his Righteousness. Pronunciation of the above Hebrew prayer in English is: BARUCH ATAH ADONAI ELOHENU MELECH HA' OLAM ASHER MILLA ET KOL HATORAH BIYASHU' HAMASHIAH IKISSA ET KULANU VETSEDKATO The early Christian sign is on both sides of the main prayer made with Gold thread. The four corners are made with Blue and Gold embroidery , each corner carries a different scripts from the Bible in English and each has the Early Christian sign with Gold thread. If you have any questions about this product by Bethlehem Gifts TM, contact us by completing and submitting the form below. If you are looking for a specif part number, please include it with your message.